Helping families plan, administer and protect estates throughout Florida for nearly 40 years Harvey Schonbrun, P.A. has been a dedicated wills, trusts, estates and probate litigation law firm for close to four decades. Attorney Harvey Schonbrun joined his father's Tampa legal practice after graduating from law school in 1972. His daughter, Amber, joined his practice after graduating from law school in 2011. His goal in every case is to protect clients' assets and families from excessive taxation by constructing clearly worded, legally sound estate planning tools in an efficient and cost-effective manner. He is Board Certified in Wills, Trusts and Estates by the Florida Bar and holds an AV Preeminent Peer Review RatingSM by Martindale-Hubbell - both noteworthy accolades reflective of his professional skills. An exclusive focus in a friendly atmosphere To better serve your needs and stay up-to-date in all the latest developments in Florida wills, trusts and estate law, Harvey Schonbrun, P.A. primarily handles estate planning and administration, probate litigation, trust litigation and select real estate matters. We have extensive experience preparing and helping our clients with: -Wills -Trusts -Durable Powers of Attorney -Living Wills -Healthcare Surrogate Designations -Irrevocable Life Insurance Trusts -Personal Residence Trusts -Special Needs Trusts -Will Contests -Claims of lack of capacity -Claims of undue influence -Fiduciary claims -Actions by and against personal representatives of the estate -Tax planning for your estate and trust -Asset Transitioning -Beneficiary Agreements -Summary Estate Administration -Formal Estate Administration -Determination of Homestead Status -Preparation and filing of all necessary probate court forms -Representation in probate court -Transferring assets -Review of estate tax returns and gift tax returns -Review of estate income tax returns and trust income tax returns We take pride in our ties to the community and have helped generations of families prepare, execute, and protect their estate plans. We build lasting relationships and have a welcoming office environment where you can feel comfortable working with us. Personal service from a qualified professional We know planning for a time when you can no longer care for yourself or be with your family is never a pleasant task. Whether you are looking to draft a will for the first time or update an existing estate plan, our firm is here to help explain the process in straightforward language so you understand every aspect of your estate plan. Our firm is also here to protect your interests and is dedicated to help you resolve disputes during probate and trust litigation.Harvey Schonbrun personally meets with all clients and oversees the paperwork, administration process or litigation from start to finish. Our firm is easy to talk to if you have any questions or concerns. Easy to access, easy to work with Located just north of downtown Tampa, Harvey Schonbrun, P.A. represents clients throughout the state of Florida, including Clearwater, St. Petersburg, Pinellas County, Polk County and Pasco County. Our firm has a private parking lot and is just minutes from all major highways in Tampa. We also work with families whose loved ones have passed away without a will. We also represent the estates of non-Florida resident decedents in need of some type of ancillary proceeding. Efficient, high-quality service devoted to helping families With the help of the right law firm, estate planning does not have to be a tiresome, exasperating process - it can become a simple step that allows you to enjoy the present instead of worrying about what the future holds. Harvey Schonbrun, P.A. is a responsive and cost effective law firm, and our team can help you make an estate plan in a matter of weeks, not months. We have been serving families in Tampa and surrounding areas for decades. The ties that bind Family is just as important to us as it is to you. We understand your anxiety over protecting their future, and our family is here to help yours. Attorney Harvey Schonbrunis a Tampa native who joined his father's law practice after graduating law school, eventually forming Harvey Schonbrun, P.A. Over the years many of Harvey's family members have worked for our firm, and some continue to do so. Harvey's daughter, Amber Schonbrun McDonnell, just joined the practice this year as an Associate Attorney. Harvey personally works with every client who comes to our firm so you can get to know him and he can get to know you. Estate Planning Board Certified in Wills, Trusts and Estates by the Florida Bar, Harvey has nearly 40 years of experience helping clients craft estate plans tailored to protect their best interests and wishes. Our main goal is to help take care of your family by building legally sound estate plans. In addition to drafting and updating a wide range of wills and trusts, our firm also creates: -Durable Powers of Attorney -Living Wills -Designations of Health Care Surrogate -Irrevocable Life Insurance Trusts -Personal Residence Trusts -Special Needs Trusts Other services that our firm provides to help you fulfill your estate planning needs include: -Tax planning for your estate and trust -Asset Transitioning and Preservation -Beneficiary Agreements -Charitable Planning and Trusts -Probate and Trust Litigation Harvey Schonbrun, Board Certified Wills, Trusts and Estates lawyer, is experienced in litigating cases in the Tampa Bay area. Probate Litigation is a practice area that involves lawsuits that arise from the actions of someone close to the deceased including, but not limited to, the following: -Will Contests -Claims of lack of capacity -Claims of undue influence -Fiduciary claims Actions by and against personal representatives of the estate Trust Litigation involves lawsuits that result from the creation and administration of a Trust Agreement. Probate and Trust Administration Probate Administration is a practice area that involves the post death administration and transfer of assets under Florida's laws of intestate distribution or pursuant to a person's Last Will and Testament. Trust Administration involves the administration and transfer of assets pursuant to the instructions set forth in a Trust Agreement. Although these practice areas often involve complex considerations, our firm is here to help assist you with all aspects of probate and trust administration: -Summary Estate Administration -Formal Estate Administration -Determination of Homestead Status -Preparation and filing of all necessary probate court forms -Representation in probate court -Transferring assets Review of estate tax returns and gift tax returns Review of estate income tax returns and trust income tax returns We work with in- and out-of-state families whose loved ones have passed away in Florida or owning Florida real estate. We also work with families whose loved ones have passed away without a will. Easy to access, easy to work with Harvey Schonbrun, P.A. represents clients throughout the state of Florida, including Clearwater, St. Petersburg, Pinellas County, Polk County and Pasco County. We also represent the estates of non-Florida resident decedents in need of some type of ancillary proceeding. Contact our Tampa office online or at 813-229-0664 to set up an appointment with Mr. Schonbrun. Our firm has a private parking lot and is located just minutes from all major highways in Tampa. Harvey A. Schonbrun's practice strongly focuses on estate planning and administration law matters, including trust and probate litigation. He is an extremely dedicated, compassionate lawyer whose focus is helping families build sound estate plans and protecting their interests during probate and trust litigation. He also provides assistance in select real estate matters. Harvey is no stranger to the area: he was born and raised in Tampa, attended undergraduate school here, and joined his father's practice after receiving his Juris Doctor. 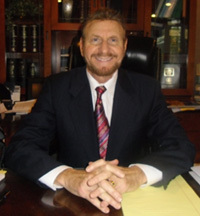 He has been practicing law in Tampa for nearly 40 years now. Outside of the firm, he is a member of the Ybor City Chamber of Commerce and the Tampa Bay Estate Planning Council. Harvey is Board Certified in Wills, Trusts and Estates by the Florida Bar, a certification based upon experience, legal ability, and ethical standards. He is also AV Preeminent Peer Review Rated by Martindale-Hubbell for ethical standards and legal ability. In 2004, he received the Have a Heart Outstanding Pro Bono Service Award in recognition of his service to others. Harvey attended Jesuit High School in Tampa. He received his Bachelor of Arts with honors from the University of South Florida in 1969 and went on to earn his Juris Doctor, also with honors, from the University of Florida in 1972. He was a member of Phi Kappa Phi, Phi Alpha Delta, the Order of the Coif, and Gold Key. Admitted to the Florida bar in 1972, Harvey was subsequently admitted to practice before the U.S. District Court for the Middle District of Florida and the U.S. Court of Appeals, 5th Circuit. He is a member of the Hillsborough County Bar Association, the American Bar Association and the Florida Bar, where he belongs to the real property, probate and trust law section. Harvey is the author of the Florida Estate Administration Handbook, initially published in 1993. He has also lectured at the Florida Estate Administration Workshop. Associate Attorney Amber McDonnell attended Academy of the Holy Names in Tampa. She received her Bachelor of Arts with honors from Wake Forest University (Winston-Salem, NC) in 2005 and went on to work for Corporate Executive Board, an international business consulting firm based in Washington, D.C. She earned her Juris Doctor from The John Marshall Law School in Chicago, IL in 2011. She is a member of Phi Delta Phi Honor Society and Eta Sigma Phi Honor Society. An article she co-wrote entitled "Complex Decision Making and Cognitive Aging Calls For Enhanced Protections For Seniors Contemplating Reverse Mortgages" is being published later this year. She was admitted to the Florida Bar in 2011. She is an active Academy of the Holy Names Alumni, a member of the Junior League of Tampa (Placement Mentor and Active Requirements Coordinator), the Philanthropic Women of St. Joseph's, and the Hillsborough County Bar Association (Member of the Real Property Probate & Trust Division, the Solo/Small Firm Practitioner Division, and Young Lawyers Division), and the Hillsborough Association for Women Lawyers. She is co-chairing the 25th Annual Georgette's Celebrity Holiday Fashion Show December 13, 2013, which benefits the St. Joseph's Women's Hospital. Located just north of downtown Tampa, Harvey Schonbrun, P.A. represents clients throughout the state of Florida, including St. Petersburg,Clearwater, Pinellas County, Polk County and Pasco County. Our firm has a private parking lot and is just minutes from all major highways in Tampa. We also represent the estates of non-Florida resident decedents in need of some type of ancillary proceeding. Contact our office online or at 813-229-0664 to set up an appointment with Mr. Schonbrun.